"Manga kootan" - this is how we call it in my mom's place. This is more like more kozhambu. This is how I do mango kootan. The main ingredients are as follow..
Take a small pan, pre heat 1/2 tsp oil and fry fenugreek seeds and red chillies, to golden brown. Turn off the stove and add coconut to it and stir it. Let it cool and grind it in to a fine paste. Take a wide pan, put the mango pieces in it with a cup of water and add turmeric powder and salt to it and let it cook for 7 mts. The mango should be tender. Now add the coconut paste to it and let it boil for another 5 mts. When everything is mixed, turn off the stove and add the curd(or butter milk) to it and stir it thoroughly so that the mango mix with the curd thoroughly. Hi, found your blog while searching for recipe for Mango Kozhambu. Tried it and it came out very well. Would love to try your other recipes too. You have written in a very simple and easy to understand manner. Thanks for the comments. Do try my other recipes. How r u? Long time no hear... 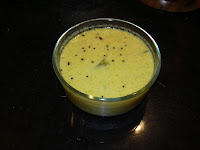 I'd try out Mango kuzhambu recipe and came out so well. My hubby just loved it. Keep in touch. Hi same as vidhya came here searching for the mango kozambu...i am pregnant and craving for something different, that i never tasted before. i tried your curry it turned out really tasty and wanted to thank you for your wonderful recipe.....going to enjoy it with rice now THANKS A LOT!